Nestled behind the main infrastructure of the Athens Wastewater Treatment Plant, a small white trailer sits among a patch of green grass. Passerbys on the adjacent highway may not notice the inconspicuous structure or know about the pressing environmental health problem that it was constructed to resolve. 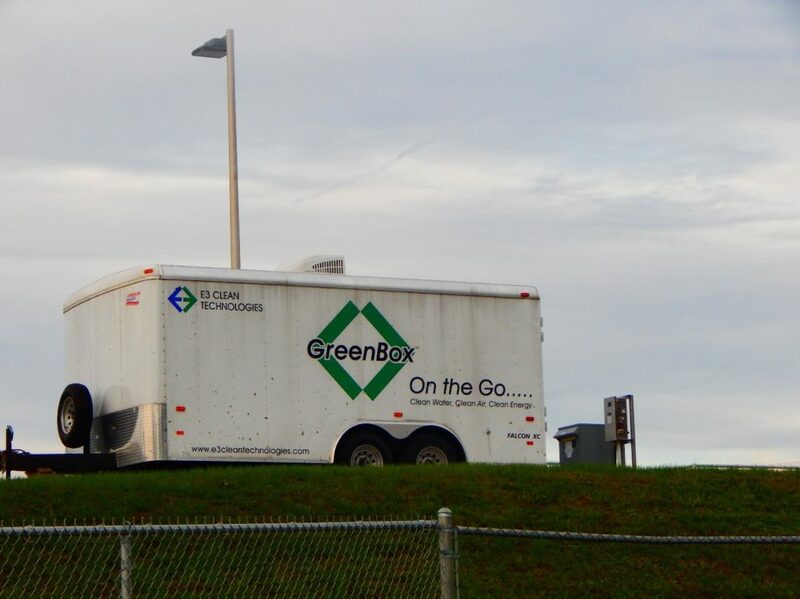 The trailer houses the GreenBox, a machine developed by Gerardine Botte, a professor of chemical and biomolecular engineering at Ohio University. The GreenBox converts ammonia, a compound derived from urine, into nitrogen and hydrogen gas. Botte’s team is currently conducting a pilot study at the Athens plant to apply the device to a real-world system. Botte said the goal of the company ETC GreenBox, launched last July, is to provide a low- energy, low-cost solution to an environmental problem that wastewater plants often face: the GreenBox oxidizes ammonia without releasing nitrate, a harmful byproduct of traditional Treatment. Researchers have long been warning about the threats posed by ammonia, which can be toxic in high concentrations and promotes the formation of harmful algae blooms in nearby lakes and ponds. Yet current research has demonstrated that nitrates, once considered harmless, impart similar detrimental effects. Botte said that although many small wastewater treatment plants in different states currently do not limit nitrate release, she believes regulations will soon tighten, as nitrates in drinking water are already regulated by the Environmental Protection Agency. Algae blooms form from rapid increases in the populations of phytoplankton, generally caused by excess nutrient release in aquatic environments. 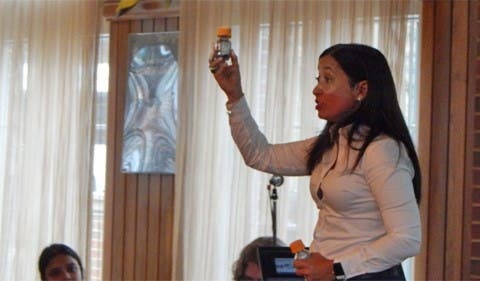 Depending on the species of phytoplankton, they can be green, yellow-brown or red. The algae outcompete aquatic plants and accumulate rapidly, resulting in a deoxygenated habitat that is detrimental to fish and other aquatic organisms. Algae blooms are becoming increasingly common in Ohio, Botte said, citing several recent occurrences in Lake Erie. Botte has even noticed evidence of blooms in ponds along East State Street in Athens. In traditional waste treatment, organic material is broken down by aerobic microorganisms that convert ammonia to nitrites and then nitrates. This stage is known as nitrification. Many small municipal wastewater treatment plants only have this step in their process. To prevent nitrate discharge, a second treatment tank would need to be constructed. In this second treatment, nitrates could be converted into nitrogen gas (which is non-reactive and inert) by anaerobic microorganisms. The establishment and operational maintenance of these “denitrification” tanks can be costly. The GreenBox will replace the need for the denitrification process in wastewater treatment plants, Botte said. Athens is currently not nitrate-regulated, but Andy Stone, Athens city engineer and director of public works, said discharge limits will likely one day be necessary. He noted that the byproducts of wastewater treatment are often repurposed as fertilizer. However, the lack of abundant farmland in Athens, along with hilly terrain and an unpredictable climate, can limit the extent of potential reutilization. 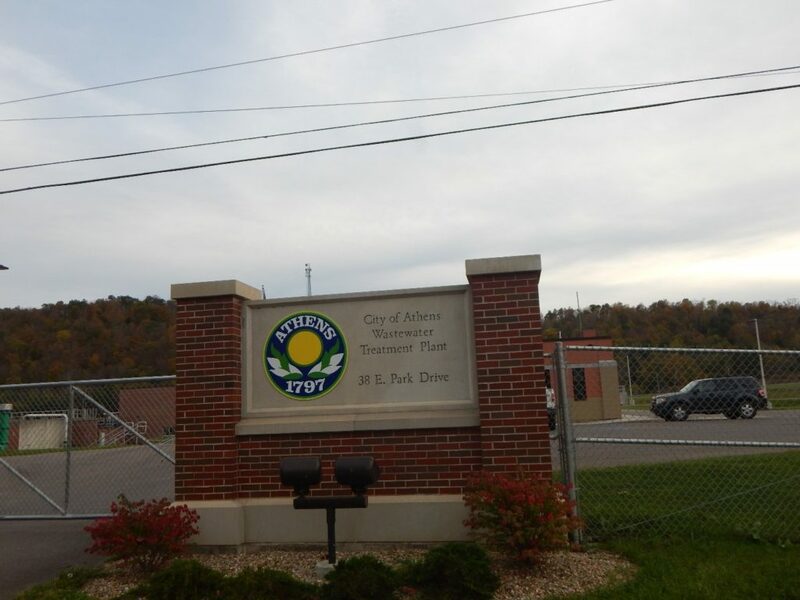 Located off of East State Street, the Athens Wastewater Treatment plant manages all of the city’s wastewater. Image credits: Amanda Biederman. Additionally, Stone said, scientists have debated whether denitrification is truly beneficial to the environment. Stone explained that the energy costs of processing nitrates may outweigh the benefits of reduced exposure. However, he said the GreenBox, which requires a low energy input, offers a potential solution to this problem. Botte’s system consists of two devices: a column that absorbs nitrogenous nutrients from wastewater and the GreenBox itself, which oxidizes those nutrients. Wastewater flows through the column, which releases clean water. Over time, the column becomes saturated with ammonia and nitrates from the waste. A salt solution containing sodium hydroxide is passed through the column, taking the absorbed waste with it. The solution, now highly concentrated in ammonia and nitrate, is directed through the GreenBox. The GreenBox consists of two electrodes, which contain a metal-based catalyst that stimulates ammonia conversion. A voltage of 0.8 to 0.9 volts – less than that of a AA battery – is applied to the system. Nitrogen and hydrogen gas, along with “clean” salt that can be reused in the system, are released. The GreenBox is positioned at a designated point in the treatment process and currently treats just a fraction of the water that passes through the plant. Samples are collected from the system every hour. The team measures ammonia levels and performs a mass balance analysis, comparing input and output levels of the compound. The team is also working on enhancing automation of the system. Botte discusses the potential of the GreenBox, and other electrochemical technologies, at a Science Cafe in Ohio University’s Front Room Cafe. Image credits: Amanda Biederman. Botte said she is enthusiastic about her group’s collaboration with the city, stating that it is critical to learn how the GreenBox functions in a real-world facility. As ETC GreenBox grows, Botte says that the new company will apply the product to different plants across the country.